To be able to install 3G Unrestrictor, you have to jailbreak your iOS device first. This makes it open for software, which Apple does not allow on the official App Store. 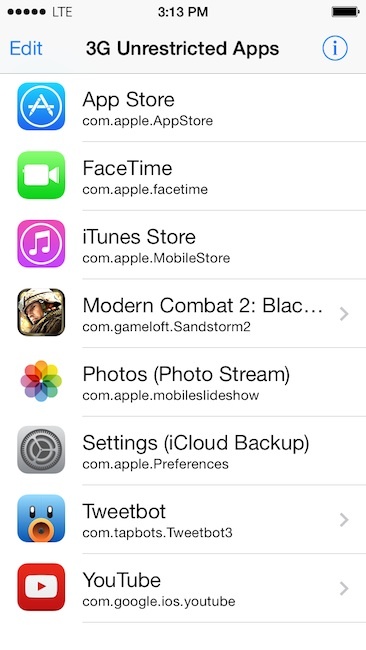 You will be able to get many different "tweaks" - apps that modify the behaviour of the iOS software. Jailbreaking is safe and can easily be reverted by restoring your device's firmware in iTunes. Apple says jailbreaking your device will void your warranty, but generally if you restore your firmware before getting serviced, they will not mind or notice. After jailbreaking your device, you will have a new app on your iPhone called "Cydia". This is the equivalent to Apple's App Store for jailbreak apps and tweaks. You will be able to purchase and install 3G Unrestrictor from there. Apple is trying to prevent jailbreaking and generally for each version of iOS a different jailbreak tool has to be used. You should also take care once you are jailbroken not to update your iPhone's firmware to new versions before a new jailbreak is available for it. To get up to date information, please visit jailbreak.kr, which will show you whether your current firmware can be jailbroken and which tools you can use. 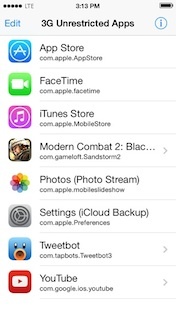 To find a how-to jailbreak for your device and version, please use ModMyI's handy guide. If you are having trouble and need help I recommend the ModMyI forums. NOTE: To figure out what version your device is running on, please go to Settings -> General -> About and scroll down until you see "Version". Once you install 3G Unrestrictor, you will have the app icon on your home screen. To use it, just start the config app and press the edit button, followed by the + button. Any app you add in the following screen will be able to use the internet on 3G without any restrictions. Note: You can add any app you want, but only apps that are somehow restricted on 3G, will behave differently. Adding mail to the list for example, will not do anything, since it has the same capabilities on 3G and WiFi. But adding the Twitter app "Tweetbot", will allow you to live stream tweets on 3G or LTE, which usually only works on WiFi!